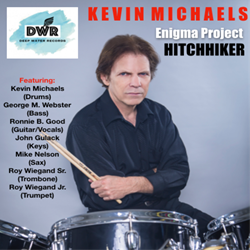 Kevin Michaels revels in the accolades of his new single “Hitchhiker” currently released from his upcoming CD entitled Enigma Project, which was originally written by his aunt and uncle Cielle and Michael Kollander. As a versatile musical veteran in the music business, drummer, Kevin Michael takes another opportunity to feed his fan-base with his newly released single “Hitchhiker”. “HitchHiker” was written by drummer Kevin Michaels’ aunt and uncle Cielle and Michael Kollander for the Four Preps in 1966, and was originally recorded as a ’45 released by Capitol. The vocal recording is a nice mainstream pop record for the time. Michael Kollander was a staff writer for A&M and Capitol in the 1960s (including for the 5th Dimension and the Nitty Gritty Dirt Band) and also played guitar with many notables including Bobby Darin, the Peanut Butter Conspiracy, Charo, and Tom Scott. Cielle Kollander was a backup singer for the Fifth Dimension, Andy Williams, Les Baxter, Roger Kellaway and others. Their nephew, Kevin Michaels, started his career recording on percussion for the Beach Boys, played with the members of Canned Heat, and has led a variety of groups since that time. 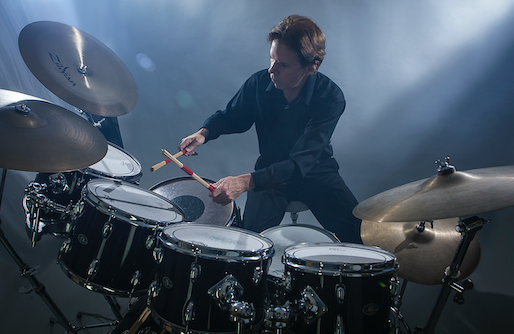 When he was booked in 2018 to headline at the Woodystock Blues Festival, Kevin Michaels decided to pay tribute to his aunt and uncle by writing a new arrangement of “HitchHiker.” The performance, which will be released in April, takes the pop tune and recasts it as a soulful instrumental played by a jazz septet comprised of Michaels on drums, guitarist Ronnie B. Good, keyboardist John Gulack, bassist George M. Webster, trumpeter Roy Wiegand Jr, trombonist Roy Wiegand Sr. and tenor-saxophonist Mike Nelson. It has fine solos from Nelson and Good with strong accompaniment by Gulack’s keyboards and the brass section. The relaxed groove is infectious and, even though the piece has been modernized a little, the new arrangement keeps the essence of the original song. When it was played for Cielle Kollander, she was visibly touched to hear the song revived in this fashion. Listeners will enjoy comparing the two versions. “I'm excited after so many years of writing and arranging, performing and recording rock, funk, blues, R&B, country and reggae tunes, to finally offer my own version my aunt Cielle and Mike's song Hitchhiker, which was a pop song written in 1966 for the FOUR PREPS. I've turned it into a brazillian bossa-nova jazz arrangement with three horns, as an offering and tribute to them for their lifes' work in the music business, which has long by now been forgotten. I remember growing up, having been surrounded by many famous musicians at the time, like Chuck Domanico, Roger Kellaway, Tom Scott, Andy Williams, Maynard Ferguson, Joe Porcaro, Emil Richards, John Guerin, including some wrecking crew members like Mike Lang, Don Randi, Leon Russell, and many others, RIP that are now long gone. I know that this version of Hitchhiker will grow on my fans, and whoever else hears it. They'll simply love it from that moment on, for what it represents: the best of the past, and the best in a contemporary jazz latin arrangement" says Michaels. Kevin looks at performance with a professional focus leading to masterful presentations in most popular genres. That is what makes his musicianship extra-special, from festivals, special events, corporate events, fundraisers and more, his band can bring the musical flavors that will sure to be a successful presentation. “Hitchhiker” can be purchased at CDbaby.com as well as on the official Kevin Michaels website. To learn more go to https://kevinmichaels.us.